Rob Sarib represented the FIG Asia Pacific Capacity Development Network (AP CDN) at the UNWGIC congress. The highlight session for FIG APCDN was “Operationalizing the UN Integrated Geospatial Information Framework” . FIG APCDN was also represented at the UN GGIM Subcommittee on Geodesy (UN SCoG). The FIG Asia Pacific Capacity Development Network (AP CDN) convened another seminar of the Reference Frame in Practice series in Suva, Fiji 18-20 September 2018. The theme and objectives of the seminar was to provide perspectives and case studies on technical matters relating to the “Operational Aspects of GNSS CORS” infrastructure. Presenters also delivered content on the - “what, why and how” to build a sustainable and modernised geodetic reference frame and datum; challenges faced in the Pacific in relation to geospatial information management and data sharing; legal, policy, and codes of practice (including standards); and the issues pertaining to developing the capacity of surveyors in the discipline of geodetic surveying. The Regional Committee of United Nations Global Geospatial Information Management for Asia and the Pacific (UN-GGIM-AP), in collaboration with the Government of Japan, through the Geospatial Information Authority of Japan (GSI) has organised the Sixth Plenary Meeting of UN-GGIM-AP in Kumamoto Prefecture, Japan, from 16-19 October 2017. As a result of workshop discussions at the reference frame in practice seminar held in Kuala Lumpur, Malaysia - October 2016 a matrix of the regional geodetic (and geospatial) challenges, and strategies to mitigate problems was developed by the participating member states of Asia and the Pacific region. Geospatial Information Authority of Japan (GSI), UN Global Geospatial Information Management for Asia and the Pacific (UN GGIM-AP) Work Group (WG) 1 Geodetic Reference Frames, and the FIG Asia Pacific Capacity Development Network convened a meeting for Asia Pacific member states on “Regional Challenges, Benefits and Opportunities of Exchanging Geodetic Data”. This forum was held prior to the UN-GGIM-AP Plenary Meeting on the 16 October 2017 at the Kumamoto City International Centre, Kumamoto Prefecture, Japan. All member states of Asia and the Pacific were invited to participate, and in response there were 44 delegates from 14 countries. Following this, there were 9 invited presentations to stimulate meeting discussions on the related themes. There were about 25 participants involved in the FIG Asia Pacific Capacity Development Network (AP CDN) “breakfast” meeting. The purpose of this meeting was to discover and share information on FIG activities that are occurring in Asia and the Pacific region, and how we can collaborate to achieve our work plan objectives. At the meeting participants were encouraged to voice their opinions on the capacity development challenges being faced by our industry and how FIG can assist to address these challenges. The Regional Capacity Network Meeting – Asia/Pacific Region was held in conjunction with the UN-GGIM-AP meeting 17-19 October 2016 in Kuala Lumpur, Malaysia. Members of the Asia Pacific FIG Capacity Development Network will be meeting with the Pacific Geospatial and Surveying Council (PGSC) in Suva Fiji to finalise their Strategic Plan. 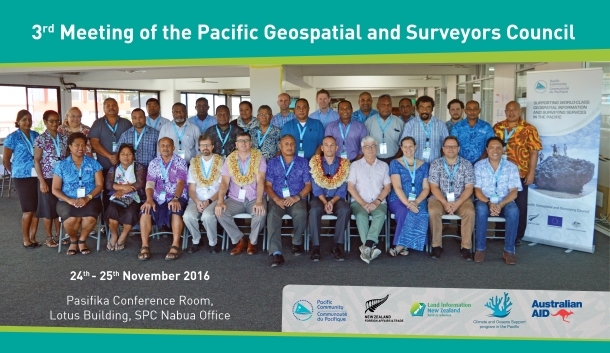 Network members from the Pacific Community Geoscience Division, Geoscience Australia, UN GGIM AP WG1, Land Information New Zealand, Mikael Lilje and Rob Sarib will also be participating in a Vertical Reference Surface workshop on the 26 November 2016, and the GIS / RS Users Conference thereafter. Development of a structure that will enable the PICTs geospatial and surveying community (and at a subsequent stage other land professionals) to become self-reliant, and have a culture of learning, innovation, collaboration, and gender equity base.